Our relationships are precious. For George Kuchar, this message is prominent in Bocko, his recent exhibition at Iceberg Projects, featuring work on and inspired by his dog and lifelong companion. Known for his campy, over the top aesthetic, this exhibition reveals the softer and more intimate side of Kuchar’s practice. George and Mike Kuchar, his older twin brother, were born in 1942 and were innovators of the low budget, DIY aesthetic—growing up in the Bronx, New York, they got their start working with 8mm. After noticing the increase in visual quality, they began working in 16mm. Though perhaps lesser known than their contemporaries, which included Stan Brackhage, Jack Smith, and Bill Griffith, they were pioneers of queer cinema, and part of the 1960s underground and avant-garde film counterculture. The Kuchars’ work had inspired, amongst others, John Waters, Andy Warhol, Kenneth Anger, David Lynch and contemporary artists Felix Bernstein and Ryan Trecartin—they were also a part of the underground comics scene through their neighbors, Bill Griffith and Art Spiegelman. In the 1970s, Kuchar relocated to San Francisco for a teaching position. Not an extremely social person, he spent the majority of his time on both coasts with his dog Bocko and cats, Blackie, Tippy, and Lily. 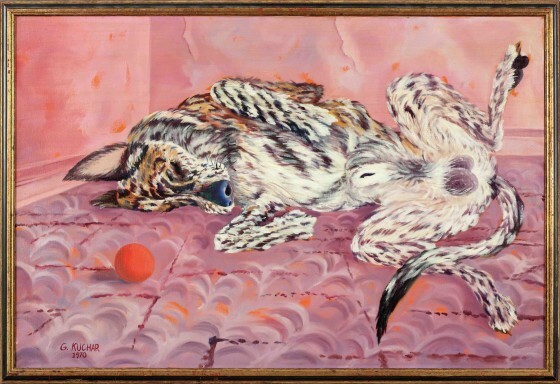 The exhibition at Iceberg Projects focuses on Kuchar’s paternal relationship with Bocko—an eponymous painting (1970) is a portrait of the dog laying asleep on the floor of his Bronx apartment; his legs are spread open, exposing his deep purple testes, and a warm ambience radiates from a red ball, which sits at the left of the canvas. Kuchar’s brush marks are precise and smooth, lovingly capturing his companion in repose. Much like the work of Brakhage and Michael Snow, Kuchar’s experimental films, such as his 10-minute piece The Mongreloid (1978), refer to the materiality of the medium and its experience. The film opens with Kuchar narrating experiences the two of them have shared; the camera alternates between he and Bocko at home, and out in the world. In the film, Kuchar’s tone mimics how a mother speaks to her children; in a classic Kuchar-ian, raunchy manner, he refers to an itch located in Bocko’s “Mookie,” the parks Bocko has defecated in, what operations Bocko has had, what Bocko likes to eat, and where he has played. The film, alongside other works by George and Micheal Kuchar, will be part of a screening at the Gene Siskel Film Center while the exhibition is on view. 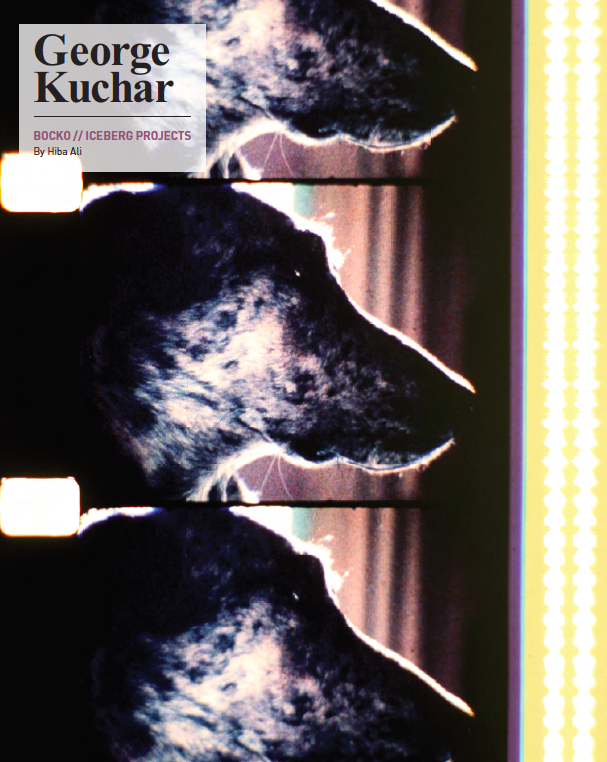 In this exhibition, Kuchar documents the human condition through his canine recounts. 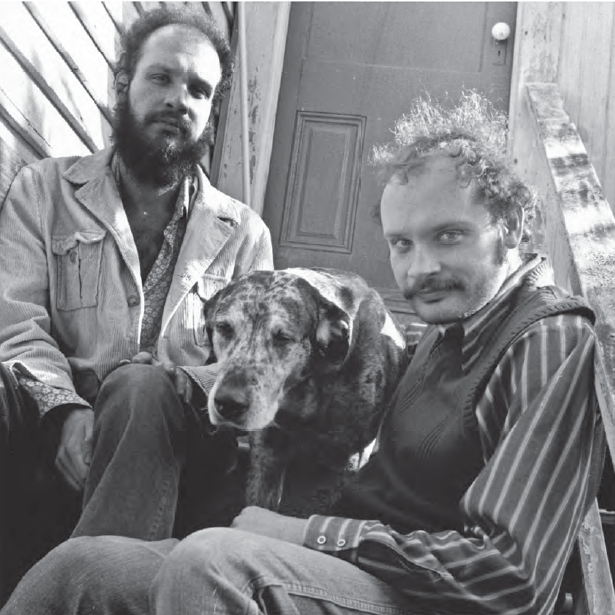 In an excerpt from “Farewell, My Pet” from The George Kuchar Reader—an expansive anthology edited by Andrew Lampert and published by Primary Information in 2014—Kuchar states, “It doesn’t matter whether you love a human, animal, vegetable or mineral. Love can work miracles…”  Bocko, perhaps more than any of Kuchar’s work, visualizes a relationship as a lasting testament to the artist’s existence. George Kuchar: Bocko at Iceberg Projects runs through October 30, 2016. Stephens, Chuck. “Exploded View | The George Kuchar Reader – Cinema Scope.” Cinema Scope. N.p., 17 Dec. 2014. Web. 18 July 2016. http://cinema-scope.com/columns/exploded-view-george-kuchar-reader/. Linzy, Kalup. “Bomb.” BOMB Magazine—The George Kuchar Reader, Edited by Andrew Lampert by Kalup Linzy. N.p., 2014. Web. 18 July 2016. http://bombmagazine.org/article/10048/em-the-george-kuchar-reader-em-edited-by-andrew-lampert. September 20, 2016 | Filed under Art Seen: Chicago and tagged with George Kuchar, Hiba Ali, Iceberg Projects.